Just as God’s people did during the time of 2 Kings and 2 Chronicles, we face pressure today to conform to our culture. But just as the Israelites discovered thousands of years ago, conformity comes at a high price. This in-depth study of two kingdoms calls you to stand out from the crowd in work, relationships, and faith. When you choose to be distinct, you can offer hope and light to a needy world. 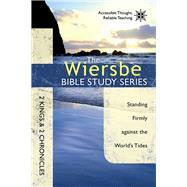 The Wiersbe Bible Study Series delivers practical, in-depth guides to selected books of the Bible. Featuring insights from Dr. Warren W. Wiersbe’s Be Distinct commentary, this eight-week study includes engaging questions and practical applications that will help you connect God’s Word with your life. An internationally renowned Bible teacher, Dr. Warren W. Wiersbe has written more than 160 books, including the popular “BE” series of Bible commentaries. He and his wife, Betty, live in Lincoln, Nebraska.